Jim Steele got lost in the Arctic a few months ago, confusing the Chukchi Sea and the Bering Sea. He also couldn't tell the difference between seasons and demonstrated that he can't read a simple chart. So it won't be a surprise to anyone that he got lost in Florida and finds statistical analysis "bewildering". Today at WUWT (archived here), in another attempt to sell his book about how all the scientists in the world have got it wrong, Jim has taken to a study of mangroves along the Florida coast. We measured mangrove area along the east coast of Florida (25°N to 30°N) each summer from 1984 to 2011 by using 30-m resolution multispectral Landsat 5 Thematic Mapper satellite imagery. All three species of mangroves found in Florida (A. germinans, L. racemosa, and R. mangle) were grouped together in our analysis. This expansion is associated with a reduction in the frequency of “extreme” cold events (days colder than −4 °C), but uncorrelated with changes in mean annual temperature, mean annual precipitation, and land use. Our analyses provide evidence for a threshold response, with declining frequency of severe cold winter events allowing for poleward expansion of mangroves. Future warming may result in increases in mangrove cover beyond current latitudinal limits of mangrove forests, thereby altering the structure and function of these important coastal ecosystems. Maybe Jim thinks he has to call all the scientists wrong in order to get anyone to buy his science denial book.Whatever the reason, he makes a habit of picking out papers to try to prove them wrong. To show his credentials to the scientific illiterati at WUWT, he said the authors "use a bewildering array of statistics". My reading of the paper is that the statistics are straightforward and not at all bewildering, even to me - and my statistics days are in the dim distant past. They used linear regression and correlation analysis, and it doesn't look bewildering at all. It tells us a lot about Jim's scientific expertise that he thinks otherwise. 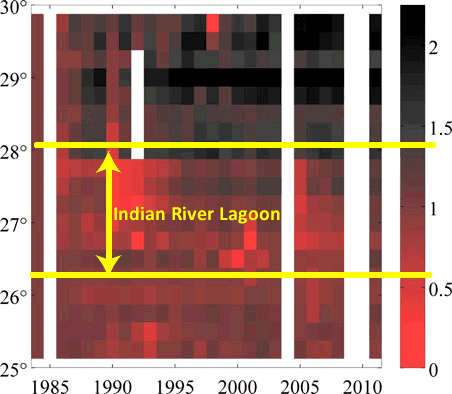 Where are the Indian River Lagoon mangrove re-establishement sites? Jim's main argument, however, was that he knew "people" who took part in shoreline restoration projects in the region of Indian River Lagoon. Jim provided a link. The Indian River Lagoon covers a large-ish spread along the Florida coast from around 27N to 29N, covering around 245 km from beginning to end by my reckoning. What Jim is arguing is that it's not the number of minus four degree days that is causing the mangroves to expand north, it's a mangrove planting project. Well I decided to see if there was anything to Jim's claim. I found a 2008 paper that reports on the project. It reported numbers of plantings, the sites and various other matters. I was struck by a couple of things, given Jim's claim that the increase in mangroves was because of revegetation projects. First of all, the paper reports around 760 survived trees from all 57 sites at the time of the report (the survival rate is reported at 10% +/-2%). There were 57 sites scattered along the lagoon spanning about 165 km along the coast. The top-most planting site was at around 28 15'N. That should indicate the scale of the planting compared to the entire Florida coastline. I've also posted a map below. The historical northern limit of mangroves in eastern North America, believed to be set by cold temperatures, is located near 30°N, just north of St. Augustine, FL (22). The area of mangrove forests increased dramatically between 1984 and 2011 near the northern range limit of mangroves in Florida (Fig. 1). Over this time period, the spatial extent of mangroves between 29° and 29.75°N doubled. Here is a map showing the above, plus the stretch of coastline along which the Indian River Lagoon revegetation sites were scattered. The top yellow arrow marks the stretch of coastline where the scientists found a doubling in mangrove area. The bottom yellow arrow marks the stretch of coast along which the people Jim knew planted mangroves. As the map shows, the area that the study referred to in regard to expansion to the north is not the same as the areas being revegetated. The mangrove planting sites are quite a way south of there. Once again, Jim Steele has shown his incompetence at best and the lengths to which he will go to try to discredit science and scientists. Fig. 2. A 28-y time series of mangrove area separated into 0.25° latitudinal bands. Mangrove area is displayed relative to the first year in the time series (1984). (Right) A value of 1 indicates no change (100% of 1984 area), 0 indicates total loss of mangroves, and 2 indicates a doubling of mangrove area. Data were calculated from Landsat imagery collected each year between April and July. White areas indicate that no cloud-free Landsat data were available. Jim has a habit of denying climate science, and of attacking scientists. That's why I believe it's important to show up his incompetence and his shallow efforts at denial. If he stuck to his area of expertise, which as I understand it is habitat restoration, he could do a lot of good. Instead he goes for doing bad and all because he doesn't "believe in" climate science. "If he stuck to his area of expertise, which as I understand it is habit restoration"
Hmm, it sounds like he has some habits he keeps doing. Ha ha - fixed now, thanks. So it won't be a surprise to anyone that he got lost in Florida and finds statistical analysis "bewildering"
According to popular belief 97% of scientists are 95% sure that they are able to predict what the climate will be like by 2100, so is it any surprise that a group of "climate scientists" can leave New Zealand on the 28th of November and get stuck in sea ice less than a month later? "According to popular belief 97% of scientists are 95% sure that they are able to predict what the climate will be like by 2100"
thats a flat out lie on your part. the 95% certainty is regarding global warming's anthropogenic origin, it is NOT regarding knowing what the planet will be like in 2100.
why do you blatantly lie like that? One of the reasons I am happy to have climate science deniers comment is so they can demonstrate to the wider world the oddities in their thought processes. Many, like Anonymous, show they have no aptitude for logic or critical thinking. Anonymous, if you would rather discuss the ice-bound ship, there are a number of other articles on the topic. This one is about the impact of climate change on mangroves and Jim Steele's ignorance, laziness and (self-)deception - and related. Why is Steele's book referred to as "science denial"? To me, it is a model of the sort of skepticism that everyone should emulate -- not just scientists. He presents a plethora of data to back up his conclusions, and his findings mirror those of many other researchers. Calling him a "science denier" (or one of the numerous variations on the theme) reminds me of religious intolerance. Christians were labeled "atheists" before they gained power and tarred those who differed on some theological matter "heretics." Your treatment of Steele has persuaded me that he has touched a raw nerve, and I shall continue to consult his invaluable book "Landscapes and Cycles." Jim not only denies climate science, he denies his own words. If you "consult" his ramblings make sure you also read some science produced by actual scientists if you want to learn about the state of the planet. If you don't check everything (and I mean every point) Jim writes you'll risk unlearning everything you might have learnt about science. For heaven's sake, don't trust what he says about papers he refers to. Don't go spouting Jim's stuff without verifying it for yourself, or you'll no doubt be regarded as a science denier yourself. He wrote his book to let people know he rejects climate science (hoping some people will buy it). BTW there are people (like Jim) who will bother to do more than say "climate science is a hoax". It doesn't mean they provide real science. They just want you to think they do, by cherry-picking from the work of the people who have done the actual science. These pseudoscientists fool some of the people some of the time, evidently. It's always interesting when fans of pseudoscientists comment on their idol rather than make a comment on what was written about in the article, in this case, mangroves. Nor do they make any observation about the hard work done by the real researchers. Deniers are impressed by words, not actions, and certainly not scientific research (as long as the words are formed as lies to say what they want them to say). "Why is Steele's book referred to as "science denial"?" I was going to follow Sou's comments in response to this anonymous troll with a detailed TL;DNR screed, but these days I am too cranky, impatient, and preoccupied to waste the time. Suffice to say that Anonymous is indulging in ignorant, ideological confirmation bias.